Tom Krueger just celebrated his 49th year as an artist on December 31, 2017. After a short sabbatical, he has returned to creating spectacular pieces of art that are cause for reflection. As Krueger puts it, he has spent 48 years “manipulating materials.” It’s been a long, sometimes trying road to travel, but when you chat with him, it is obvious that Krueger’s tenacity comes from his service in the Air Force and time spent in Vietnam. He is full of stories and remembers the mountains and skies of Vietnam with boundless detail. It’s those recollections that help him create stunning sculptural landscapes. Interestingly, Krueger’s first love, pottery, was a sort of accident. After enrolling in college, he soon found out it was the art classes that drew him in. In one, he was given five pounds of clay and had to figure out what to do with it. He was captivated when he realized he had this material that he could take in his hands and manipulate into, well, almost anything. That was his first experience working with clay, and it helped him choose a path that he would travel for a lifetime, albeit a sometimes winding path. While it was and always will be his first love, Krueger is not just about pottery. Not by a long shot. Over the years, he has learned to “trust his gut” to lead him in new and exciting directions. From painting and sculpture to in-school programs working with at-risk youth to hands-on art classes, his is a career that connects young and old on common ground. These days, Krueger relishes commissioned projects along with creating spectacular wall sculptures he has aptly named Tree Shields. The Shields are a commemorative piece in honor of his 70th birthday. Crafted from Baltic Birch, a high-density wood from Russia, 17 bolts are used to raise the tree off the base. The raising of the tree panel, along with extensive sanding to soften the edges, creates a unique shadow. The base panel, or sky panel, consists of 1/8” Baltic Birch, expertly airbrushed to recreate the amazing views Krueger remembers from 23,000 feet and his time in the Air Force. The finished pieces are breathtaking and range from 30 to 48 inches in diameter. He has several Tree Shields ready and waiting for new homes. 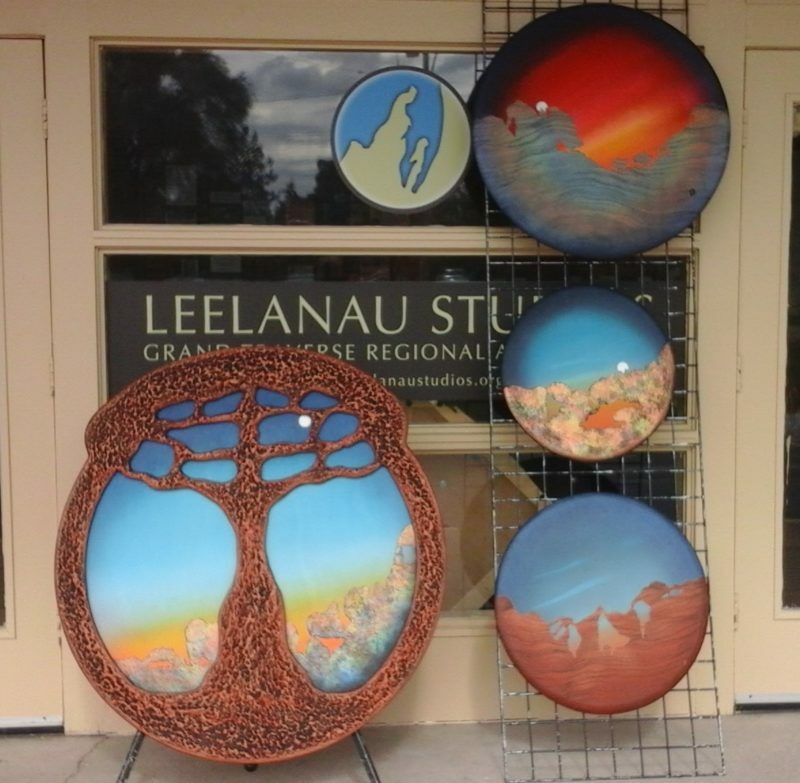 Currently, Leelanau Studios has a display of Krueger’s work that includes his very first piece of pottery. In addition, he is available for commissioned work and will be teaching classes he calls Clay Play for adults and children.